Integrating your WordPress site with ONTRAPORT provides great features including sharing content and adding membership levels to your WordPress posts and pages. Merge Fields and PURLs give you the ability to personalize the content with your customer's Contact Record information. Imagine your customer seeing a personalized page when they log in. "Welcome back, John Locke!" is much more engaging than just "Welcome back!". The merge field function also enables you to quickly take advantage of another engagement technique: PURLs. PURLs are ONTRAPORT's special Personalized URLs. A landing page, whether it's a Legacy Landing Page or ONTRApages page, is automatically available as a PURL after you publish it. Instead of a link like "offers.pages.ontraport.net" the URL can read "john.offers.pages.ontraport.net". Do you think someone will click a link with their name in it more often than a generic link? Of course they will. An ONTRAPORT Pro or above account. A WordPress Site Integrated with ONTRAPORT. 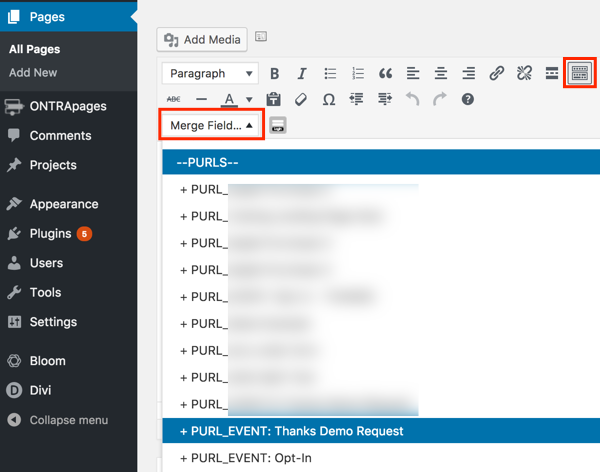 To insert a PURL into the page, scroll down toward the bottom of the Merge Fields. All of your published Legacy Landing Pages and ONTRApages are listed as PURLs. Q. Can I show the merge field content to a customer before they log in? A. No, in order to see the merge field's content the customer has to be logged into your WordPress site. Q. What happens if I don't protect the page with a PilotPress Access Level, and someone sees the page? Do they see the ugly raw merge field, or data from my Contact Records? A. If they are not logged in the merge field is empty and they see a blank space. They do not see the merge field code itself, nor do they see any data from your Contact Record. Q. Can I hyperlink the PURL? Insert the PURL merge field in the Visual editor. Switch to the Text editor by clicking the Text tab. Q. Can I copy the merge fields to an ONTRApage that is displayed in WordPress using the separate ONTRApages plugin? A. No, the ONTRApages plugin does not support the use of merge fields. You can use merge fields on an ONTRApages page that is used as a PURL, but only if it is hosted directly on your domain or on one of ONTRAPORT's domains. See Publishing Your ONTRApage for more information on your hosting options. Is there any way to display merge fields without the user being logged in? I am wanting to link to wordpress pages from an email and show personalization of name and other merge fields without having to have the user logged. Is there any way to do this?? Hi Seth - don't know why I missed this question earlier, so I apologize for that! We edited the page today to update it for the new features and did answer your question in the FAQ. The merge fields only work if the member is logged in. You can use a merge field on a PURL page landing page (Legacy Landing Page or ONTRApages) but alas, not a landing page imported into WordPress using the new ONTRApages plugin. There is a fairly complex method you can use to host our landing pages on your domain in a sub-domain such as offers.your-domain-name.tld where "offers" is the sub-domain. A page at offers.your-domain-name.tld/spring-offer could be a PURL and a PURL merge field link from an email leading to that page would have merge fields filled in.